I tend to shy away from historical sites because I don’t particularly enjoy explaining painful, conflict-filled history to children (just one of many reasons I don’t homeschool my kids). Utah’s history is no exception, so I was a little wary the first time I visited This is the Place Heritage Park. Do I want to relive the settlement of Utah by white people in the 19th century with its colonization of native lands, religious conflict and war with the U.S. government? Not really. On the other hand, are antique quilts, hand-carved wooden toys and Old West shootouts charming? You bet your booty they are. 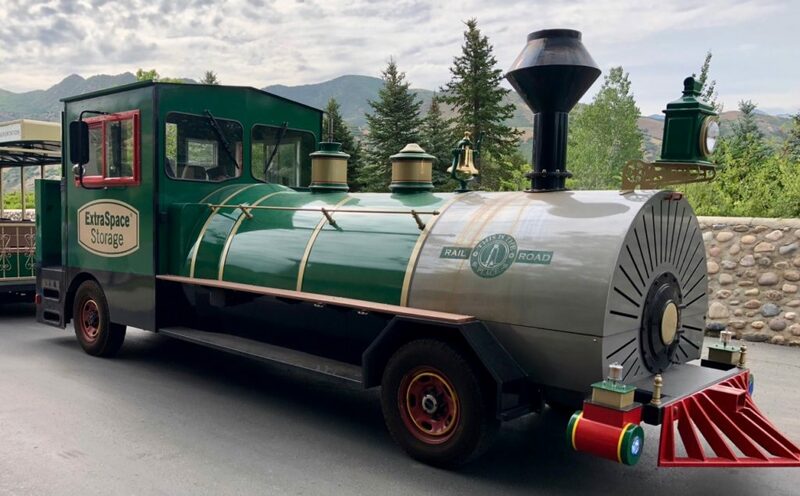 In This is the Place Heritage Park, Salt Lake City boasts what has to be the world’s best mashup between an amusement park and a living history museum. Since that first fateful visit, I’ve been back many times because it’s my kids’ favorite place to go. Forget roller coasters, let’s pan for gold! 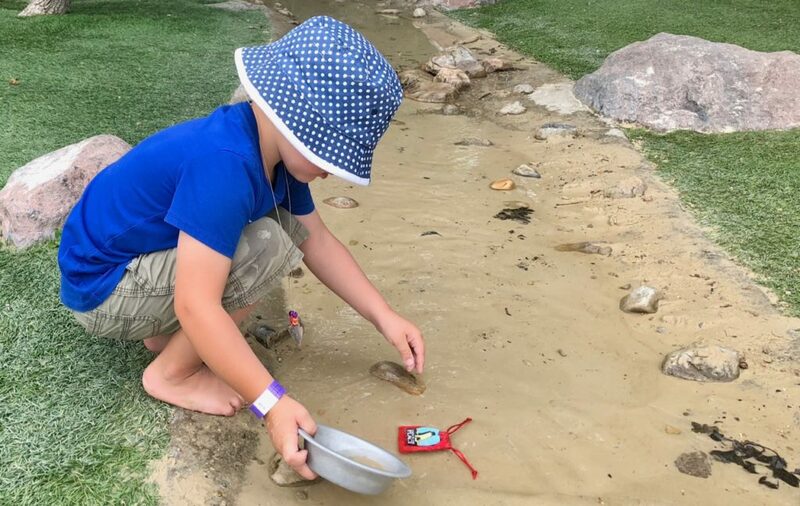 Panning for gold is one of our very favorite activities. The park makes you feel as though you have stepped back to the days of the early settlers of Utah. It even does a decent job trying to present multiple perspectives: there is a monument to all the different religions represented in the early days of Utah (although my kids had zero interest in that, of course) and there’s a Native American Village with dancers performing in heritage presentations. The majority of the park is heavy on Mormon pioneer history (did you have any doubt that it would be? ), and has replicas or originals of many prominent buildings and family cabins from the early days of the state. It also features employees and volunteers in pioneer dress, including musicians, schoolmarms, and occasionally bandits and sheriffs. If you like antiques and long for the days when kids wished for a simple carved pistol rather than the latest phone, this is the place for you. The famous Native American dancers perform in the teepee at the top of the hill. 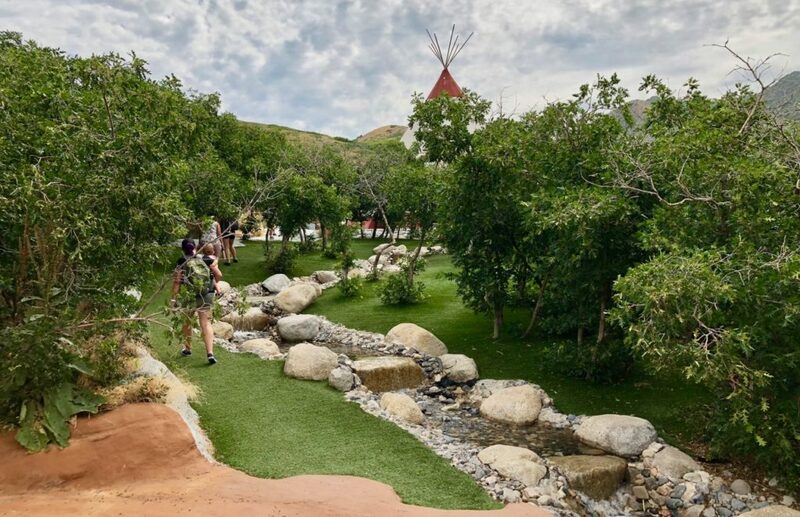 There’s so much to do at This is the Place Heritage Park that it’s worth doing a little research and planning your visit ahead of time. Your kids are very likely to poop out before you can see everything. The Native American Village. My kids absolutely LOVE watching the shows here, which are hosted in the giant teepee at the very top of the hill. Check for showtimes and don’t miss it; the dancing is so impressive it’s worth planning your visit around. The featured craft here is making an arrowhead necklace, always a crowd favorite. Across the street from the Native American Village is another of our favorites: the Treasure House. Make sure to buy a little bag inside for $1 to hold all your treasures. Behind the house, the kids can “dig” for gems in Prospectors Pit and then pan for gold in the shaded stream. Quite frankly, we usually get stuck here for an hour. The one kid who isn’t obsessed with pretend valuables can climb on the adjacent pirate ship playground. A few steps down the hill is the mini-train, which is a must-do for anyone with toddlers. As you head back down the hill to main street, watch for the wood-carving shop — my boys love watching the men there carve, but then always want to buy wooden pistols, so there’s a downside. Stop in the bank around the corner and get your gold weighed. Be careful, though, because you can actually deposit your gold here. We all know that depositing money at a bank means exchanging valuables for a piece of paper. Kids don’t, though, and we have had more than a few tears when the gold disappears forever. If you’re lucky, you may be part of a robbery on your way in or out of the bank. If it’s hot, Irrigation Station (the spray park) is right here, with conveniently located picnic tables so you can feed the hungry monsters. Kids can get a shave at the shaving parlor. 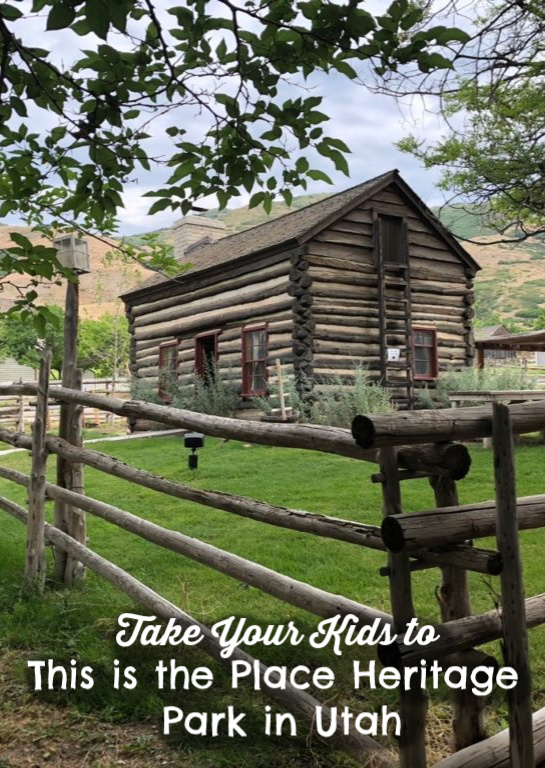 They also get a kick out of the chance to wash clothes on a washboard and play with pioneer-era toys, so keep an eye out for these activities inside of some of the pioneer homes. Make sure to visit the schoolhouse. In the summer, at least, there is usually a schoolmarm leading a lesson as well as kids in costume. My boys hate real school, but for some reason love sitting here hearing about corporal punishment. Go figure. If you have a horse-lover, one great use of your three hands-on activities is the pony rides. Be sure to take the train. The terrible jokes are worth it. Take the train. This is the Place Heritage Park is built on a hill, and little legs get really tired. There is a train (complete with conductor telling terrible jokes, which my kids love) that travels in loops around the village. When you first walk in, there is a train stop just across the street. Wait there for the train, then take it all the way to the top of the park, to the Native American Village. Now all your walking will be downhill — brilliant. Dress for the weather. The park is open year round, and involves a lot of walking. In summer, bring lots of water bottles and slather the kids with sunscreen. Pack food. You are allowed to bring in food, and I would recommend doing so. We always spend longer than we anticipate here. If you need to buy lunch, the Huntsman Hotel offers a limited menu. For a treat, don’t miss the mini donuts at Brigham’s Donuts. 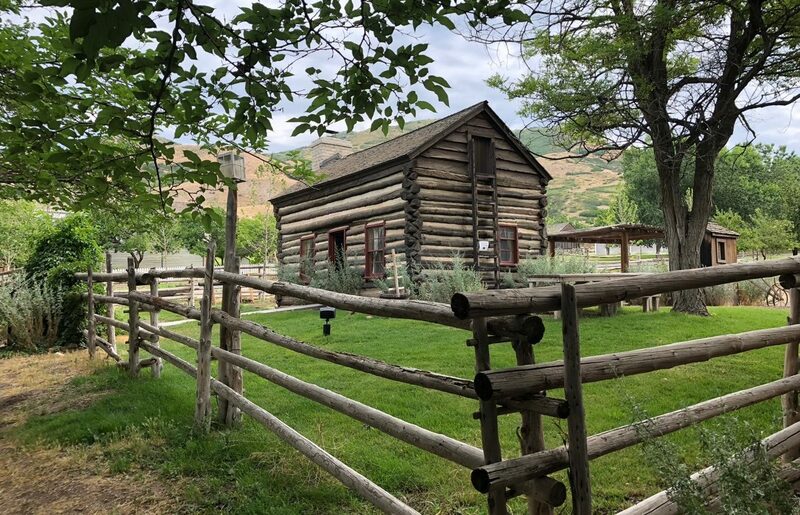 This is the Place Heritage Park is located at the mouth of Emigration Canyon, just south of the University of Utah, at 2601 East Sunnyside Avenue, Salt Lake City, Utah, 84108. For more information, visit their website.